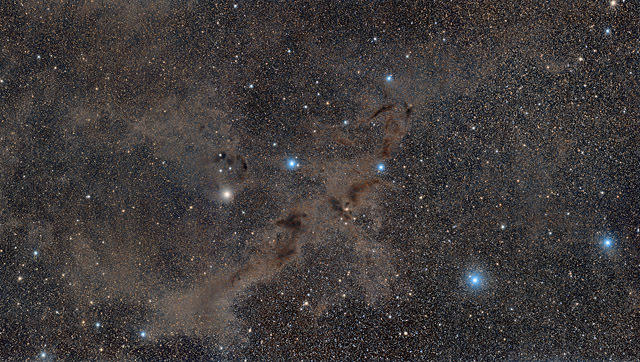 Barnard 228 is part of the Lupus molecular cloud. Lying in the constellation of Lupus, the Wolf, B228 earns its nickname as the Dark Wolf Nebula. A portion of the Milky Way runs through Lupus, giving this image a very high density of stars. This image is a three panel mosaic covering a field of view of roughly 6 degrees by 3 1/3 degrees. In this image, South is up. Software Used Images Plus 5.75 for camera control. Images Plus 6.0 for calibration, stacking, and ArcSinH stretching. Photoshop CS5 used for levels and curves, cropping, match color, lab color, vibrance and selective color. Pixinsight 1.8 for Mosaic Merging, Dynamic Background Extraction (gradient removal), Color Calibration), Morpholoical Transformation (star shrinking), ACDNR (noise reduction), SCNR (color correction) Histogram Transformation (stretching) and image annotation. HLVG for additional color correction, Gradient Xterminator for gradient removal. Carboni Tools for additional noise reduction and smoothing. Registar 64 for stack alignment, mosaic calibration and registering. Notes This mosaic turned out to be quite a challenge and learning experience for me. One of the big battles I had to fight with this image was capturing the data. At 34 degrees south declination, B228 never rises higher than 21 degrees in altitude. I captured some of the data for this mosaic when the nebula was as low as 14 degrees. When an object is that low in the sky, we're looking through a much greater amount of atmosphere, which makes it difficult to capture good details. Fortunately, the atmospheric seeing was pretty good on all the nights. In conjunction with the relatively short focal length of my 600mm lens, I was able to net some respectable data. The biggest change for me with this astrophoto was that I relied very heavily upon Pixinsight for much of the processing. While I find this program not particularly intuitive to use, there are many processes it has which are extremely powerful. I imagine I'll be using it more consistently in my workflow, as I'm rather pleased with how this image turned out. This image was published in the Readers' Gallery section the January 2016 issue of Astronomy Magazine! And then, to top it off, this image was also published on pp. 64-65 (yes, 1 1/2 full pages!) of the June 2017 issue of Sky and Telescope Magazine! !